The DISIC (Interministerial Directorate for Information and Communications Systems) is attached to the SGMAP (Secretariat-General for Government Modernization, under the control of the Prime Minister). It is responsible for the transformation of the government information systems and of their convergence. It is in this context that the government information systems department supports the development of a French enterprise architecture method. This is why it supports the initiative for a public method. Praxeme positions the definition of the enterprise values in the intentional aspect. It recommends a rigorous approach to these questions with separate analysis and design parts. The former consists in isolating the moral reality of the enterprise, to take advantage of it; the latter concerns the drafting of the discourse on the values (the societal responsibility of the enterprise…). This document gathers together the preparatory thinking with a view to developing the axiological (= concerning the values) procedures planned in the Praxeme method. It is available on the wiki. CEISAR (Center of Excellence in Enterprise Architecture) shares common beliefs. It expresses them through a platform in seven points. CEISAR recommends structuring the operational model into three models, as show in the figure below. Like Praxeme, it isolates an abstract model, upstream from the organization and the processes. This approach is essential to ensure innovation in the organization and the quality of the information system. The arrows on this diagram show the links or determinations. The equivalences with the aspects of the Enterprise System are easily established. The components of the operational model as defined by CEISAR and their Praxeme equivalences. The “Pragmatic aspect approach” guide completes Praxeme version 2. Based on the new version of the Enterprise System Topology, it specifies the relations between the pragmatic aspect and the intentional aspect and integrates the BPMN notation for process modeling. The use case description form and its comments have also been published. See the announcement page on the wiki. A new deliverable within the context of version 2: a process-description form; its instruction manual. See the dedicated page. 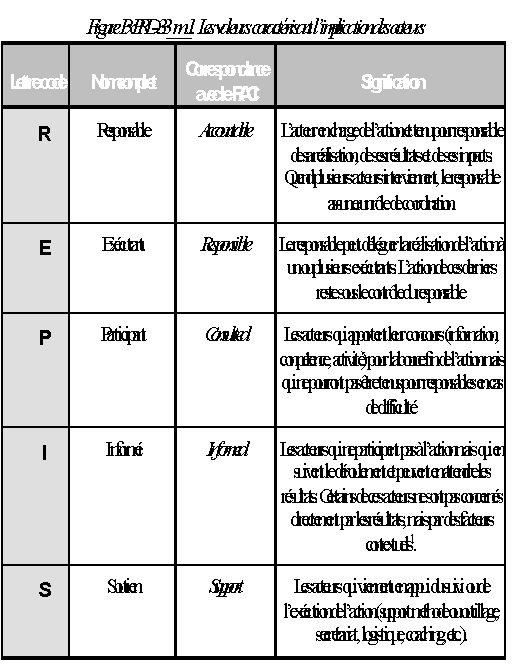 This delivery contains a new qualification matrix concerning actor involvement (French form of the RACI).